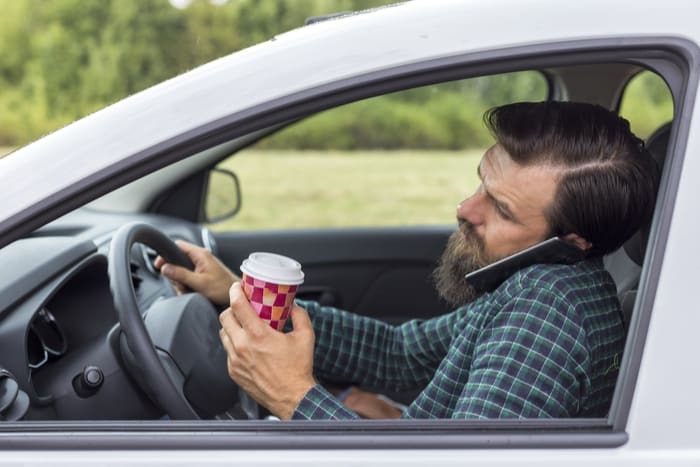 The Dilemma: Picture this: You’re on the highway, minding your own business, when you hear your phone chime—it’s a text message. You know you shouldn’t reach for it (after all, it can wait) but what if it’s something important? You dig through your bag in the passenger seat, all while trying to keep an eye on the cars to your left. Your phone chimes again, your GPS reroutes you and the soy latte in your cup holder spills all over the floor mats. These distractions are all happening in your general vicinity, and instead of watching the road, you’re watching chaos unfold in your car. That’s a recipe for disaster. The Fix: Put your phone on silent. So many visual distractions stem from the phone, whether it’s checking a text message or mapping your destination. Put your phone on silent to resist the temptation to check, and if you need a GPS, turn your texts on silent and the volume on loud so you can listen to your route. If you don’t trust yourself to leave your phone untouched, put it in the backseat where you can’t reach it. The Dilemma: Ever drive somewhere and not remember how you got there or really have any memory of driving at all? You’ve just experienced a mental distraction behind the wheel, and while it’s not good, it’s definitely not uncommon. It’s easy to zone out (especially on long, straight stretches of road) while driving. The Fix: Increase your mental stimulation as you drive, while still focusing on the road. Try listening to interesting podcasts, making a playlist of songs you’ve never heard before or listen to an audiobook. Keep your mind active and alert. And be aware if your mind starts to wander, especially if you start getting tired. Pull over and rest for a few minutes if you have to. And consider practicing meditation when you’re off the road to sharpen your cognitive abilities behind the wheel. The Dilemma: There’s no such thing as down-time anymore. We’re wired to be more active than ever before, even while driving. This lack of attention span is incredibly dangerous behind the wheel. Fidgeting with the radio, eating and talking to other passengers are manual distractions that can divert your attention from the road. The Fix: Set boundaries in your car. Try not to adjust the radio, pull over to eat and let any passengers know that you can have conversations, but that they need to be respectful of the fact that you are, in fact, driving. Kahaner, Larry. (2017, September 18.) Keep Your Mind from ‘Zoning Out’ On the Road.